Whetzel Preserve is comprised of three miles of steeply wooded, scenic hillsides along the Monongahela River. Commanding views of and from the property are only one of the benefits the land provides to neighboring communities. There is no designated parking at Whetzel Preserve and visiting involves a steep up hill hike from Bunola Drive or requesting permission from a neighboring private landowner to access from the top of the ridge. It is the visitor’s responsibility to find safe and legal parking. This is a regular destination for local hunters during ALT hunting season and is perfect if your looking for a challenging uncharted hiking destination. If you’re trying to plan a hike in that area that is a little less rustic, but no less rewarding, we recommend visiting the Dead Man’s Hollow Conservation Area. 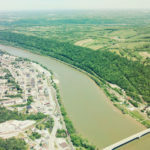 Allegheny Land Trust acquired this 212-acre property in Forward Township in 2003, commonly known as “Mon Valley Slopes” or “Elkhorn Slopes.” Conserving this site provides habitat for wildlife, stormwater filtration, as well as commanding views of the river valley. Allegheny Land Trust has dedicated this parcel in the name of Joshua C. Whetzel Jr. Whetzel’s lifetime of accomplishments span western Pennsylvania including protecting over 30,000 acres while serving as President of the Western Pennsylvania Conservancy from 1969 to 1978.